The evening honored Ralph Stayer, Chairman and CEO of Johnsonville Sausage; Ali and Christina Christensen from “America’s Got Talent” television talent search program, Jim Hynd,VP of Pharmaceutical Products at Abbott; Dan Buttling, SVP of Premium Brands at Diageo;and Jack Cassidy, President of CEO of Cincinnati Bell. The event was held the evening of February 26, 2011 at the Waldorf=Astoria Hotel. An extensive live and silent auction included travel packages, autographed sports memorabilia and unique jewelry. After the dinner and award presentations, guests were entertained by a top-shelf musical act, Rubix Kube. 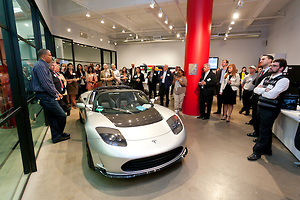 Photographed by New York event photographer, Jeffrey Holmes Photography. Jeffrey has photographed this premier New York event for the past five years. 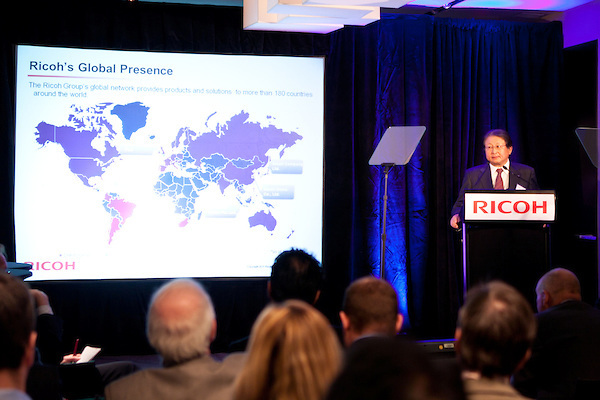 Jeffrey commented, “It is one of my favorite events to cover. It is a great cause, a wonderful group of organizers and VIP guests plus a terrific venue that makes creating great event photography New York style!” His event photography is published in the Boomer Esiason Foundation’s printed and web marketing and public relations program throughout the year. “Given the theme…The Flavor of Life, it would be easy to assume the focus of the event is good food and eating well. To me, the theme calls to mind two ideals, Living life to the fullest extent possible and Coming together from all walks of life to achieve our mission. It is up to each of us to determine how to make the most out of the life we’ve been given. I always am humbled to meet people from the cystic fibrosis community who not only have accepted the hand life dealt them but also have embraced the fact that despite CF, their lives are rich with possibility and opportunity. We will meet some of these courageous people tonight, and I know you will be touched by their strength and their optimism. 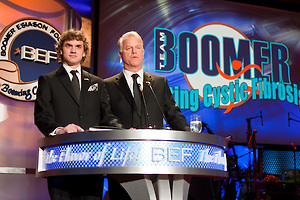 The Boomer Esiason Foundation’s “Booming Celebration” tradition began in 1993 when a close group of friends gathered at a small Long Island pub to help the Esiason family in fighting a cause close to their hearts. That year, 175 people joined together to raise $60,000. Enthusiasm and support has grown exponentially over the years. Today, the 800 people who attend the annual flagship fundraising event help to raise valuable contributions. Over the years, the Booming Celebration has raised millions in support of the cystic fibrosis community and the fight against CF. But the real stars of Booming Celebration are the children and young adults who are living with cystic fibrosis. 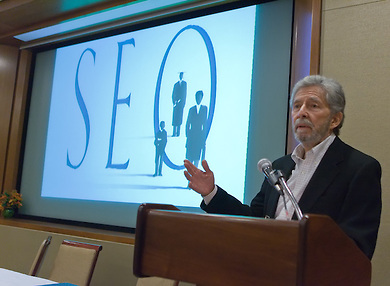 In 2003, the guests who gathered to mark the event’s 10th anniversary were captivated as 11-year-old Gunnar Esiason made his first public speaking appearance. Just three years later, Gunnar and his sister, Sydney, were the hosts of Booming Celebration. Now, Gunnar is 19 and living, breathing proof that people with cystic fibrosis can live full, happy lives. The opportunity has never been greater to develop new drug treatments for Gunnar and the 30,000 other Americans living with cystic fibrosis. About 91 percent of every dollar raised at Booming Celebration and other Foundation events enhances their lives and gives them more tomorrows. 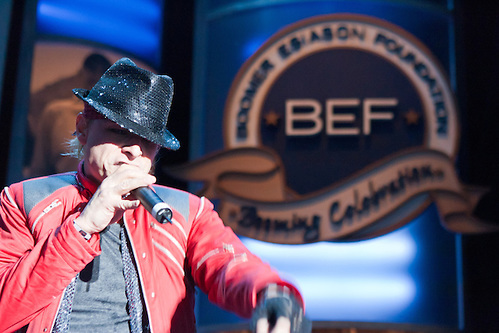 BEF’s Booming Celebration honors the Boomer Esiason Foundation’s Most Valuable Player each year. It is also an opportunity to congratulate others who have played a significant role in the Foundation’s success over the past year. Our annual awards recognize those extraordinary people living with CF, a special board member and other friends of the Foundation whose efforts often take place behind the scenes. Ralph Stayer (c)of Johnsonville Sausage receives MVP award from Gunnar Esiason (l) and Boomer Esiason (r). 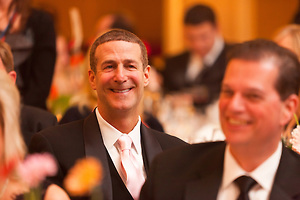 Photo by Jeffrey Holmes, Event photographer New York. 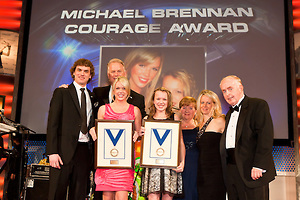 Ali and Christina Christensen awarded Michael Brennen Courage Award at BEF Booming Celebration for cystic fibrosis. 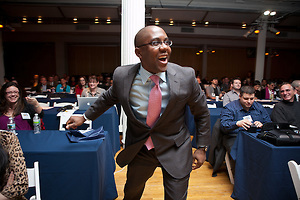 Photo by Jeffrey Holmes, event photographer New York. This award was established in 2000 to hour the memory of BEF’s friend and colleague Michael Brennan. 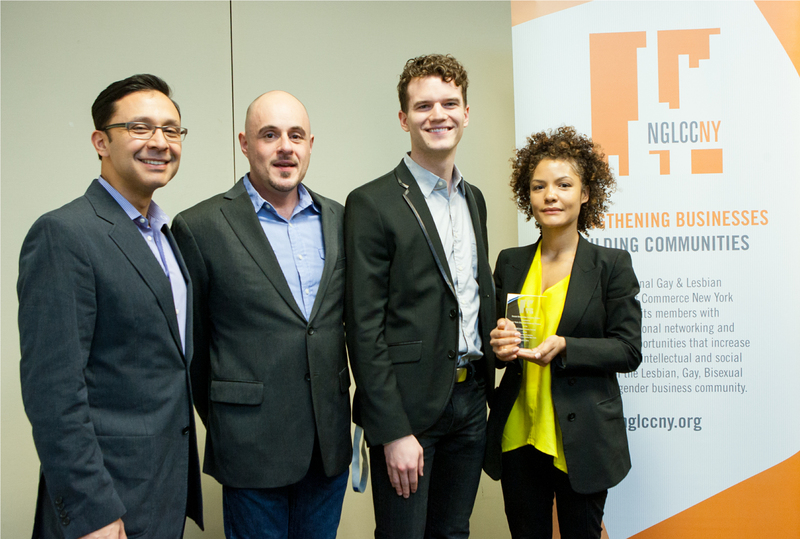 It is awarded to outstanding individuals living with cystic fibrosis. Singing Sisters put Cystic Fibrosis in the National Spotlight. Ali and Christina Christensen thrilled the cystic fibrosis community in 2010 when they made it into the Top 10 on the popular “America’s Got Talent” television show. The sisters, who both have cystic fibrosis, charmed the show’s celebrity judge panel and won over a national audience. Behind every great success, there are great people. The Quiet Giant Award was established in 1999 to recognize people who diligently and quietly aid in the fight against cystic fibrosis. Throughout his career, Mr. Hynd has maintained a unique focus on putting patient needs first and he has tirelessly championed those living with cystic fibrosis in particular. Over the past 15 years, Jim has led his colleagues in fundraising and volunteer efforts that benefit the CF community. Boomer Esiason met Mr. Buttling several years ago and has built a relationship between Diageo and BEF. Thanks to Dan and his team, Diageo is a proud supporter of BEF and a partner in the fight against cystic fibrosis to find a cure. 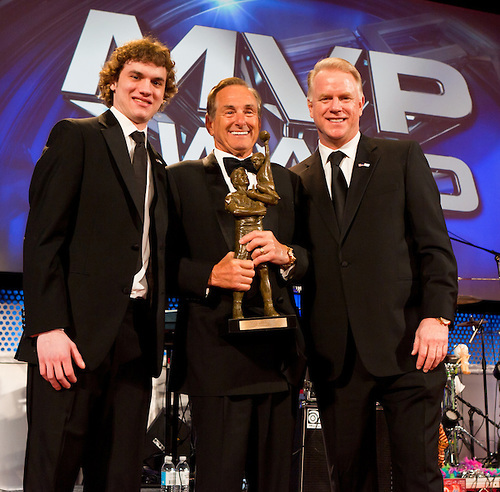 The Timothy M. O’Brien Award was established in 2003 to honor a Boomer Esiason Foundation Board Member who exemplifies the success and drive Tim showed. 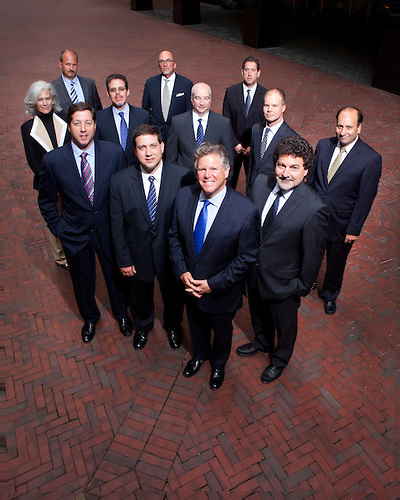 As one of the Foundation’s original Board Members, he was the first to introduce a major corporate relationship to the organization. While Mr. O’Brien’s death in the September 11 terrorist attacks devastated the Foundation, the Timothy M. O’Brien Award ensures his memory lives on the hearts and minds of his many friends. As a BEF Board member, Jack Cassidy has helped launch cause marketing programs that have raised millions of dollars in support of the fight against cystic fibrosis. For example, one corporate program has generated significant contributions to the cystic fibrosis fight since its inception in 1999. Jack also organizes an annual sporting clays shooting event near Cincinnati, which as raised significant funding for the Boomer Esiason Foundation. To date, these programs have generated valuable dollars in the fight against cystic fibrosis. Rubix Kube performs at BEF Cystic Fibrosis benefit. Photographed by Jeffrey Holmes event photographer New York. Booming Celebration features live entertainment every year. This year guests were treated to an 80’s Experience by RUBIX KUBE. This group has taken New York City and surrounding boroughs by storm, headlining regularly at NYC’s best and most legendary venues. RUBIX KUBE is the premiere ’80s tribute band of NYC and beyond. Past year’s have featured top-shelf musical acts including O.A.R, Credence Clearwater Revisited, KC and the Sunshine Band, Kool and the Gang, Hootie and the Blowfish, Richard Marx and Don Felder, formerly of The Eagles as well as Joe Piscopo. This entry was posted on Friday, March 11th, 2011 at 10:47 pm. It is filed under Assignments and tagged with awards, awards dinner, BEF. Boomer Esiason Foundation, benefit dinner, black tie, boomer esiason, corporate events photographer New York, corporate photographer, cystic fibrosis, event, event photographer, event photography new york, Jeffrey Holmes Photography, New York photographer, non-profit, photographer for events, Rubix Kube, speakers, VIP, waldor astoria hotel. You can follow any responses to this entry through the RSS 2.0 feed.